I will readily admit to the incompleteness of my research on The Order of Apollyon, but it seems that some former members of Belgian brutal death outfit Aborted have been busy engaging into side projects. It remains to be seen if 2009 Aosoth or now 2010 The Order of Apollyon will be long-running “covenants” as the bio sheet professes. 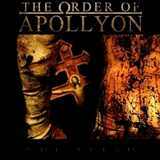 With the engagement of James McIllroy (Cradle of Filth) on guitars and Peter Benjamin (Akercocke) on bass, BST and Daniel Wilding were able to put their first line-up for The Order of Apollyon together, so their own version of religious and mystical devotion to the Supreme Entity they preach can be realized. Within expectation cultivated on the Listenable roster, and especially given the backgrounds of the players, The Order of Apollyon The Flesh is a mixture of brutal death riffing and black metal atmosphere. That would be a cursory and simplistic explanation. More nuanced, The Flesh has a pronounced industrial militaristic edge to it, very capably mixed with eerie black atmosphere, the latter made particularly effective at the beginning of Word and throughout ominous domineering Never. Saying that The Order of Apollyon is a typical by-the-numbers death/black sprout is an easy trap to fall into, as aggressive and bashing as they come, yet there are twists in The Flesh all along the way that make you want to dig deeper. And once you do, more dark shining angles reveal themselves, which will make the album stand out further. From the opening moments of the intro God Speaks you know what’s coming – a non-sparing aural barrage – yet there is this psychological press in the band’s delivery where slight detuning of the chords neighbors well with tight militaristic marches. The Order of Apollyon can machine-gun riff and sync their bottom end with the best of them, this is all brutal as hell, but they happen to do so standing right on the edge of the opening up Gehenna (Ich Bin Das Licht). With that approach industrialized death metal meets the apocalyptic tones of the future, so that the hammering home can yield to guiding and gliding melodic passages (White Dust). Multiple hellish vocals, sometimes as if reading an indictment (Flesh Of Yhvh), are suitable when this giant tightly produced blacksmith is about to slide into a chaotic inferno. The Order of Apollyon are obviously skilled enough musicians to suddenly change the directions of their songs and make them go in all kinds of different directions, not to mention stand-out leading guitars. Tempos effortlessly go up and down within a scope of the same composition (Ich Bin Das Licht) and pounding clanking death metal can yield to a loosely riffed Swedothrash in an instant (Fifth). The Flesh is somewhat in danger of being dismissed as yet another product of modern death/black genre, but I would argue that it is a very superficial assessment. Far from being faceless, with an interesting production to match, the band’s whole on this album seems to be more than the mere sum of the familiar ingredients.